Sylvester Stallone has defied what it means to be restless. The guy is beyond restless, he is still hungry and at 68 that is truly astonishing. 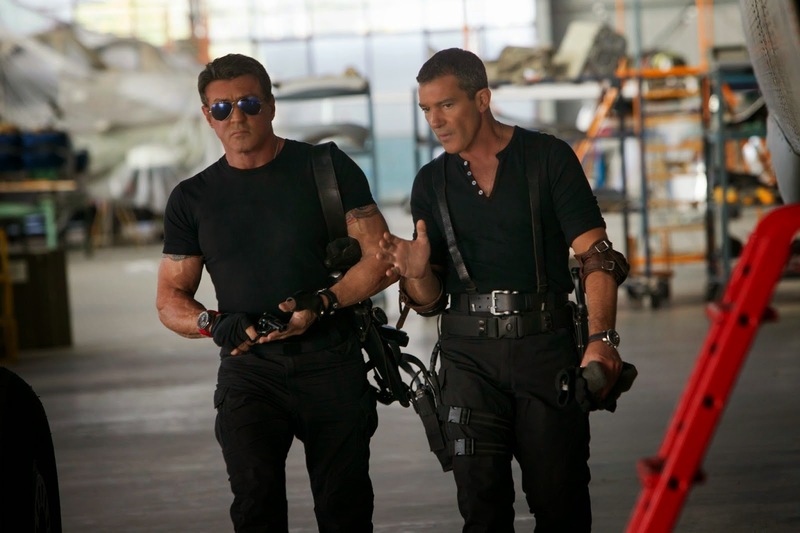 You might think he and half of his co-stars in this third flick in the Expendables franchise might be tired of going through the motions and introducing new characters who are old friends with simple backstories, but defy you they will and with The Expendables 3 Stallone and crew have turned up the volume while toning down the blood and the swearing. I will admit to always having a good amount of fun with these movies and never really seeing any need to complain as they know what they are and more or less deliver on what they promise. To that point, I actually enjoyed what I can remember about the second one more than what I can remember about the first largely due to that finale where Stallone along with Arnold Schwarzenegger and Bruce Willis lined up and just gave us what we desperately hoped the first would deliver, not to mention the hand to hand combat showdown between Stallone and Jean Claude Van Damme. I appreciated the mixing of Stallone's mentality with Jason Statham who more or less is leading a new wave of action heroes today. These were elements we are meant to enjoy because of what they represent within the context of pop culture society and so I was at least appreciative for the countless winks and nods, the bad dialogue and the blood that spewed everywhere because that's what audiences wanted and that's what this mixed bag of knitty-gritty 80's stars and newly relevant tough guys planned to deliver. As we come to the third chapter in the saga though it is as if you can feel the toll the last two adventures have taken on our aging actioners no matter how much they try to mask it. The new rating wipes out a lot of the more honest aspects of what kind of relationships exist in a large group of all men and it certainly takes the CGI blood down a few notches (now there's just impact sounds! ), but the elements of a large cast and a big action scene every now and then are still here, but the energy is clearly stalling. Barney Ross (Sylvester Stallone) get his ear talked-off by Galgo (Antonio Banderas). We begin, as expected, with a large action set piece as our Expendables who are now only made up of Barney Ross (Stallone), Christmas (Statham), Gunner (Dolph Lundgren) and Toll (Randy Couture) fly over a speeding train in a helicopter in an attempt to rescue former Expendable Doc or "Doctor Death" (Wesley Snipes) with their bust 'em down, shoot 'em up disposition. After the deed is done they then take off to another action set-piece where Caesar (Terry Crews) has been staking things out and has enabled them to infiltrate the dealings of a wanted arms trader. Things take a slight change of course though when it is revealed the target is actually Conrad Stonebanks (Mel Gibson) who Barney believed to be dead because he himself thought he killed him. In a rage, Barney begins spraying bullets in Stonebanks' direction and his team-members join in killing countless people in a shipping yard that results in Stonebanks getting away and Caesar being rushed to the hospital. This is an eye-opener for Barney and so as Caesar sits in a coma he plots his revenge while dismissing his old team so that he doesn't have to wear the guilt of watching them all suffer in a hospital bed or worse. This time, all of Barney's actions are under the supervision of Max Drummer (Harrison Ford), a higher up in the CIA who is over Willis' Church, negating him, and who also turns out to be a damn good pilot. While Drummer attempts to locate Stonebanks Barney must put together his new team and thus we are introduced to retired mercenary Bonaparte (Kelsey Grammer) who leads us through a montage that gives us Thorn (Glen Powell) the tech guy, Mars (Victor Ortiz) the weapons specialist with a lethal shot, Luna (Ronda Rousey) the obligatory female who works as a nightclub bouncer and beats guys up in heels, and John Smilee (Kellan Lutz) a former Navy Seal with an attitude problem. These juveniles show Barney the stealthy, less messy way of approaching situations which works out at first, but inevitably fails to the point the young and old crops will put aside their differences in order to achieve the main goal. It is interesting that in even trying to describe this movie one must go out of their way to include all of the characters that come into play and their reason for existing within the main narrative of the film. In the summary of the film above there is no mention of Schwarzenegger, Antonio Banderas or Jet Li simply because they are relegated to either bit parts or roles that seem to exist only so they can be a part of the ensemble, but don't really serve the story in a necessary way. Once again though, like the story itself and even the development of these characters, the details matter very little as Stallone's action flicks live or die by the formula. I found it interesting that even here, when the younger generation of thinkers, planners and quiet killers infiltrate the ideas of what an action movie should be and try to move it into this century Stallone and his two co-screenwriters can't help but revert back to the shoot 'em-up style in the films big conclusion. Don't get me wrong, the final showdown delivers in spades what audiences expect from an Expendables film as the location is ideal and even interesting (a demolished casino) while everyone gets their chance to shine as the action is captured through aerial shots and intricate movements that document the agility of a number of the characters in thrilling fashion, but we can't help asking ourselves how necessary it all is. It doesn't help the editing is so quick you can hardly keep up with what is unfolding while only making it more obvious that Stallone isn't able to perform his stunts the way he once could and no doubt still wants to. The inclusion of these younger members gives way to the most interesting dynamic the film has to offer though in the throughline theme of the repercussions of living this lifestyle. Barney sees himself as the keeper of the keys in that he gets to decide what his teams fate should be no matter what they intend to do with their time on earth. He needs the rush that the missions give him to continue to survive in a way that he feels means something, but cannot see this kind of thought or determination in others. We wonder if there is regret there, though such complex emotions are avoided almost as soon as they are brought up. There are numerous conversations between Barney and other characters about what it's all amounted to, the important things in life and if what they sacrificed for this lifestyle was worth it all. There are easy answers given in the way of family comes in many different forms, yet with all this perspective Barney (like Stallone) still feels restless and in no way discourages the younger members from following his lead. He even only allows them to change his way of approaching situations to their sleek and quiet style rather than his brute and loud fashion until it proves ineffective in which he turns around and fights back in the same way that resulted in him feeling the need to kick his old team to the curb. The key to this whole thing might actually be the not totally necessary inclusion of Antonio Banderas as Galgo who takes an interesting approach to the mentality of a man who wears the guilt of losing all of the men around him yet still feels the need to redeem himself with more risk and with the possibility of more death. It is an unquenchable thirst in other words and thus will result in Barney dying an inglorious death because he can't stop. 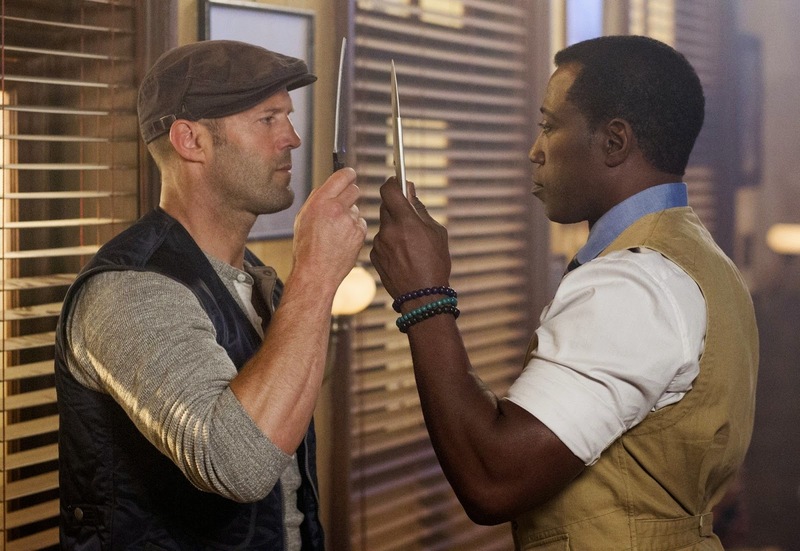 Christmas (Jason Statham) and Doc (Wesley Snipes) measure their knife skills. The fact there is even a hint at this set of ideas in an Expendables film is surprising enough, but that it even acknowledges the likely trajectory of these characters lives and the facts of their existence is interesting and something I guess we should have expected in a third film of a series. To the main point most will want to know about this film though is that it is indeed fun if not a bit long. These films were made to be alternative programming and indeed ended up transcending any of the current Hollywood trends to be nothing more than a re-vamp of pure 80's pulp. There were fears that with an ever-changing roster of aging and up and coming action stars that this third installment might become more about the expanding universe than the central conceit, but new director Patrick Hughes is sure to keep himself in check (thus why the themes didn't start flowing and the bullets kept flying) and deliver not only what audiences expect, but what they want from a movie like this. While the narrative can become a little lagging in pace and go for too long of stretches in the middle without an action scene there is plenty of juicy performances on hand here to stall your appetite until the next explosion comes along. Statham is given very little to do throughout the course of the film which is disappointing, but Snipes is clearly up for the fun. He certainly spices up the rather blandly documented opening sequence and even tries to create a new catchphrase. Ford gets the films one F-bomb and a "that's gotta hurt", while getting to put on his angry man growl and really go after it. None of the new cast members make much of an impression though Liam Hemsworth must be pissed at Kellan Lutz. Then there is Gibson, who gets to spew lines such as, "want me to open your meat shirt and show you your own heart?" and, "It's hard to beat an enemy when he's living inside your head." There is also the matter of the caveat of not being able to kill Stonebanks that allows for Gibson to flourish and gives way to a more extravagant character approach in which he turns it into a caricature. 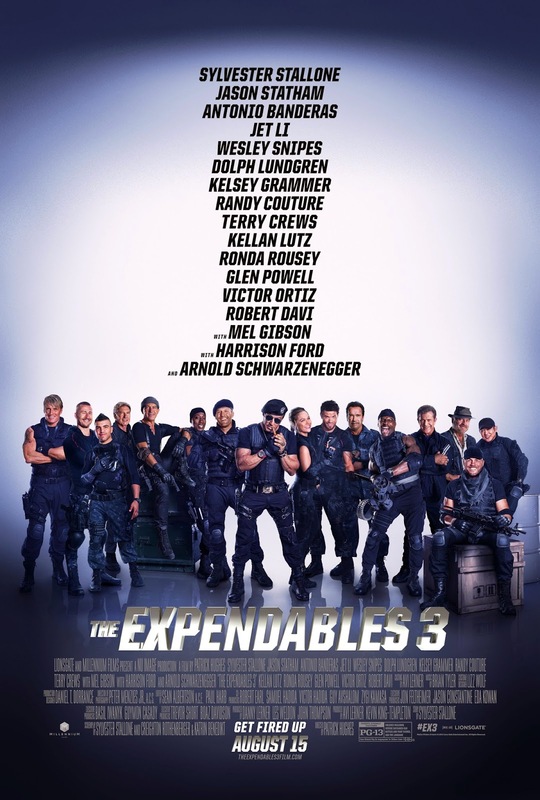 All of this adds up to an Expendables 3 that isn't all it could have been, but it is fine for what it's intended to be and will likely be praised by those it's aimed at.